ASTEROCERAS PROMICROCERAS CYMBITES - JURASSIC LYME REGIS. ASTEROCERAS / PROMICROCERAS / CYMBITES - JURASSIC, LYME REGIS. Asteroceras obtusum (J.Sowerby) , Promicroceras planicosta (J.Sowerby) and Cymbites neglectus Spath. 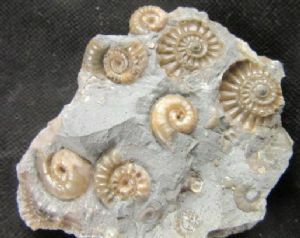 Small piece of grey limestone with beautiful well preserved calcitic Ammonites on both sides. Rather unusual to find at least three different species on such a small piece of matrix. Collector's item. Jurassic, Upper Sinemurian, Charmouth Mudstone Formation. Obtusum Zone. Specimen : 7.5 x 6 x 2.5 cm. Sorry, this item is now sold.